Team Copioli: Catching Our Own Shot! This entry was posted in Build Blitz 2014, Team Copioli on January 7, 2014 by . Good morning! Here’s a quick update on what happened during the late-night hours. Team Copioli is currently on the practice field, where we’ll be for most of the morning. You can follow our progress on the livestream here at BuildBlitz.com, or on twitter @TeamCopioli. One of the issues we encountered during testing last night was that the ball kept falling out of the robot as we were driving. We’ve added some retaining devices to help. Here are the side retainers. They’re simple, but effective – bent PVC pipe to match the shape of the ball. 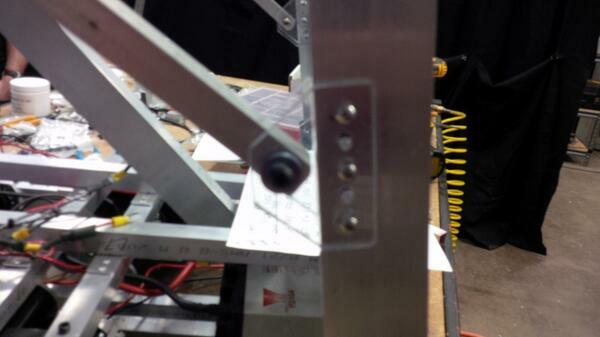 We also added another retainer that’s attached to the kicker. This replaced the lexan sheet we had yesterday that kept causing issues with the travel path of our shot. Wooden hard stops were replaced with aluminum ones, properly mounted this time. Finally, we’ve made some changes to our code, including adding some automated sequences, to help with the launch. 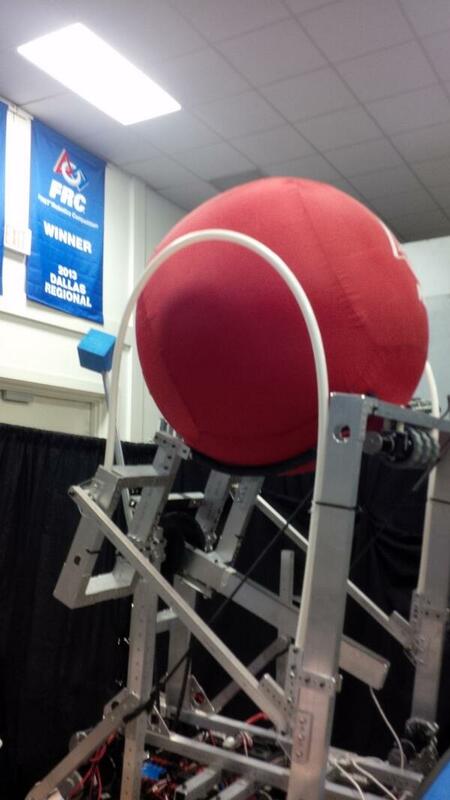 Now the press of one button will both launch the ball, and reset the arm. Tonight, Team Copioli went over to the practice field at Greenville HS. The intake, launcher, and tusks were all installed and wired up, so it was time to test! It took some time to get started, as evidenced in our last post. We updated live on Twitter and on Vine, so here’s a collection of the highlights. We finally hit our first high goal! It was the milestone we’d all been waiting for. The rest of the evening was focused on letting our drivers get accustomed to the robot, and figuring out how to get the results we wanted as they got a feel for the controls & the tweaks we were making in the design. As you can see, the net was cut shorter so as not to interfere with the launch. The ‘down’ position for the intake was also adjusted until we found the right way to come down over the ball. 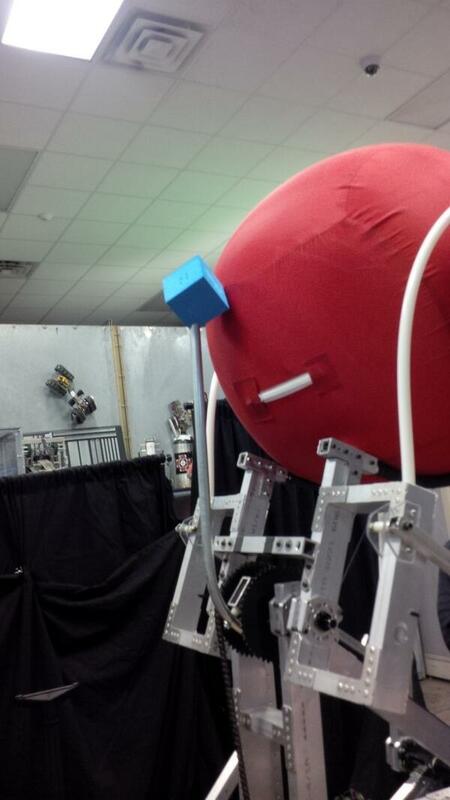 The team quickly realized that the ‘sweet spot’ for hitting high goals was if the robot was moving towards the goal. The flatter trajectory made things much smoother. There were definitely still improvements to be made, but we decided that since we were finally ‘in week 6’, we would be freezing the design (other than minor tweaks – no NEW additions). The drivers would be spending their time perfecting the running shot (for high goal and the truss) and we could work on adding in an autonomous mode to be ready for the judging showcase tomorrow. This would allow us to focus on getting consistent shots, and comfortable drivers. As the drivers were practicing, they rammed a corner goal- and it didn’t sound good. Wall: 1, Team Copioli: Zero. Back to the shop for some fixes, and then we’ll start practicing again tomorrow morning. 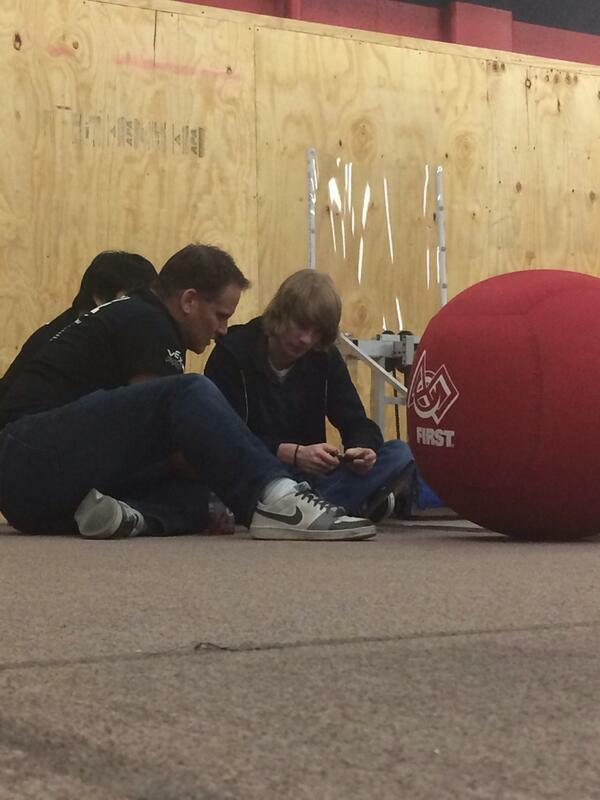 In a typical 6 week FRC build season, every team navigates ups and downs with a nearly unparalleled intensity. Saturday night (well, Sunday morning), Team JVN experienced one such roller coaster. Around 2 am, BJC and Jay finished what was thought to be the final intake roller assembly. 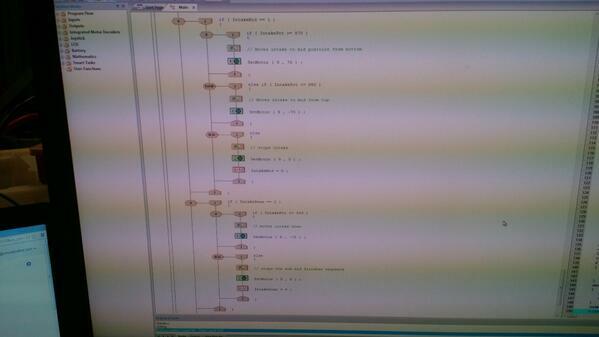 Spirits were high – it had been a productive evening, and the prototype for this subsystem had worked flawlessly. Giddy with excitement (and sleep loss), the team mounted the intake to the prototype base, connected to a battery, and…. …the ball got stuck. Badly. “Pull it out, let’s try again.” Same result. For the past few hours, the team had been finishing up their individual portions, and were preparing to wind down for the night. Now they gathered around. “Pull it out. Try it again.” No dice. “Pull it out. Try rolling it in.” The same. A floor intake had been determined early on to be a crucial competitive feature – and an intake that doesn’t take in game objects is of little help. The team gathered around the robot for a late night design review. After some tense back-and-forth, the decision was made to scrap it and start from scratch. It was around 3 AM, and that’s when something happened that defines and bonds competitive robotics teams. The team immediately split up and went to work, silently at first. Randy and Charles started assembling the modular electronics panels. Aren was on a mission to finish the launcher arm and base. Jay and Carlos started disassembling the intake roller, and BJC went straight to CAD to figure out what went wrong and set up new geometry. All hands had come in for the “what do we do now” meeting, but after a direction was set, it was back to business as usual. Getting disheartened and throwing your hands in the air amplifies the problem. Facing it head on helps productivity – if everyone tries to fix the roller, the electrical panel won’t get done. It helps morale – seeing Aren’s completed launcher assembly (that everyone had a hand in designing) was positively beautiful. But most of all, it helps retain forward momentum. When the team came back in Sunday morning, we had a completed launcher and a new design for an intake roller (that ended up being successful). Every FRC team will experience moments such as this in their 6 week build season, many times even worse. But the teams that have the resolve to press forward, to learn from the mistake and use it as an iteration rather than a roadblock… those are the teams that will excel. This entry was posted in Build Blitz 2014, Team JVN on January 6, 2014 by . Team Copioli: Hurry up and wait. And test. 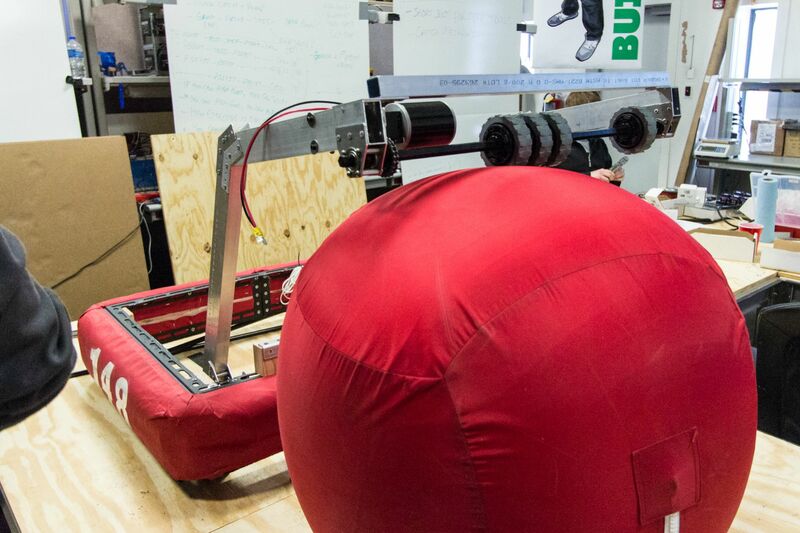 The initial testing process for any FRC robot is a slow and tedious one. No matter how much you try and simplify your design, these robots are inherently complex with a wealth of potential failure points. Every PWM connection, crimp, fuse, and line of code could fail, leading to a debugging process that could run from mere seconds to hours. This is magnified in the initial testing phase, because by definition nothing has been tested. As such, you come to the field with big aspirations, but end up doing hours of tweaking. That’s the point Team Copioli is at right now. We’ve had some issues with code, hard stops, positioning, and other various items. Still, the times the robot has run consistently, we’ve seen a lot of promise. 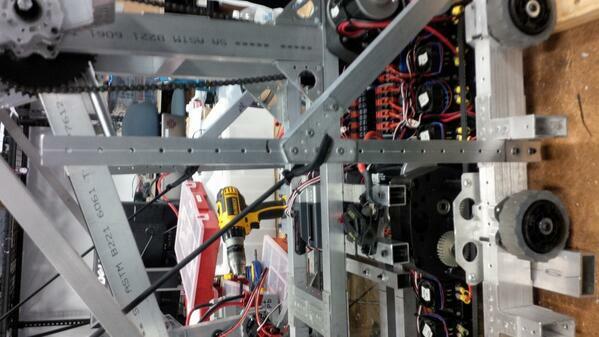 The drive train is where we want it to be, while the shooter seems to be very close to being ready. We’re going to spend the next few hours trying to iron out these kinks, and hopefully we’ll be draining shots soon. Stay tuned to the stream to watch our progress, and follow us on Twitter at @TeamCopioli for live updates. This entry was posted in Build Blitz 2014, Team Copioli on January 6, 2014 by . 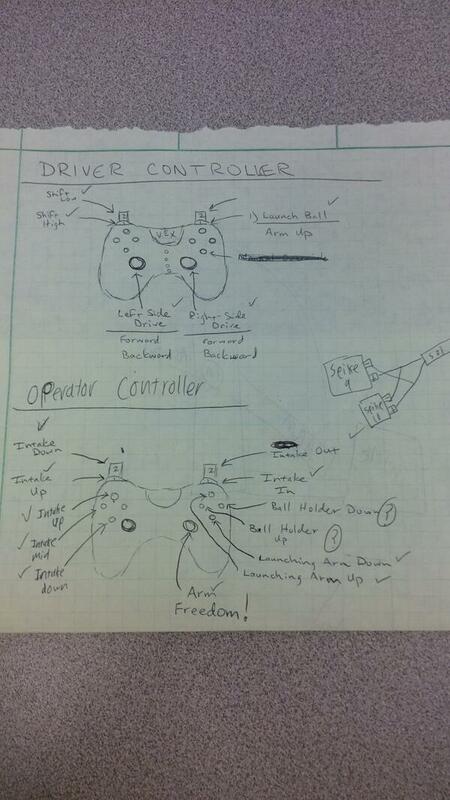 Here’s how the driver controls are going to be set up for Team Copioli. Both teams are using the VEX Cortex control system instead of the standard FRC control system, just so we can get these robots up and running quickly. This picture shows the layout we have planned. JVN shared two really great articles with the Social Media team here at Build Blitz. They tie in perfectly to his presentations on the engineering design process for competition robotics, and his now-famous mantra – “Design is an iterative process!” – so we wanted to share them with you and talk about how they tie into the Build Blitz. “An idea is nothing more or less than a new combination of old elements. The capacity to bring old elements into new combinations depends largely on the ability to see relationships.” -James Webb Young, in his book ‘A Technique for Producing Ideas’, first published in the 1940s. Write to Done talks about Young’s process in this article. Each year after kickoff, many teams’ first thoughts on design are based upon looking at older years’ games with similar elements and seeing how the most successful teams put their robots together. For the 2014 challenges, there are a lot of comparisons being made to 2008 – the game object is essentially a smaller version of the trackball, and so looking at downsizing manipulators seen in Overdrive is a logical first step. “Steal from the best, invent the rest.” Here at Build Blitz, we’re lucky enough to have mentors from all three of the 2008 World Champion teams in the house. Steal from the best, indeed! Every robot in FIRST today is inspired by a combination of past designs. With each game release comes a set of comparisons to past concepts, and teams that are smart about their designs can take bits and pieces of the ideas presented in previous years and improve on them as adapted to the new challenge. Everything in design comes down to a three-step process, as outlined here. Nobody works alone when it comes to great ideas, and the FIRST community is a great example of that. Copy, Modify, Combine. Whether it’s with previous designs from your own team, or bouncing ideas off of friends from another team, there are countless ways to adapt to Aerial Assist. Take an idea that’s worked in the past, and adapt it to the new game. Make small steps away from what you’ve got in order to improve it, and then compare the results and bring everything you’ve learned so far into your next iteration. We hope you’ve been able to gain some helpful knowledge from watching our process here at the Build Blitz. As always, if you have question or there’s something you’d like to see more of, you can reach us at @BuildBlitz, @TeamJVN, and @TeamCopioli on twitter. This entry was posted in Build Blitz 2014, General on January 6, 2014 by . Hey FIRSTers! Despite it being the middle of the might, the past 6 hours have been very eventful in terms of fabrication for Team Copioli, so we wanted to give you a short update on the structure for both the intake and launcher we installed, as well as the linkage that connects them. Here’s a short video explaining the linkage. 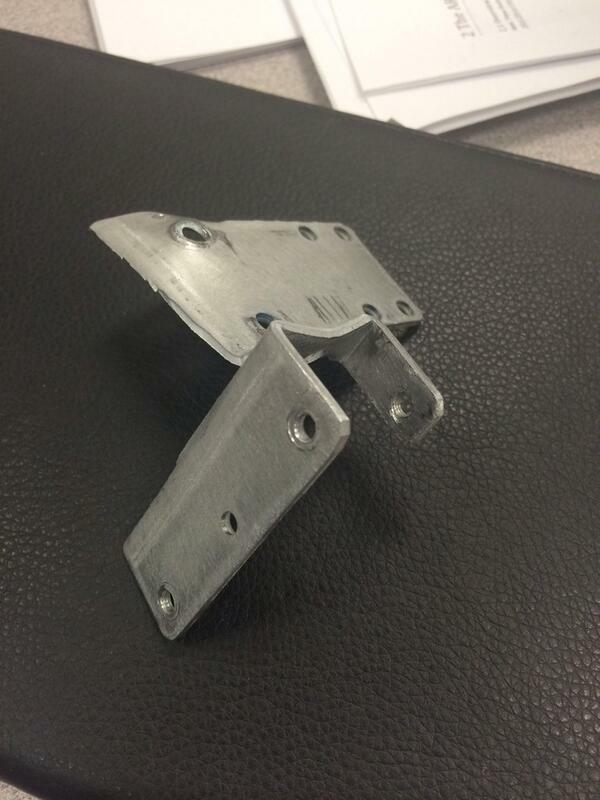 Here are some homemade lexan mounting brackets. A nice quick solution that can be made by any team. The intake in the lowered, active, position. There was one minor setback last night. The late night crew left a note describing the issue. One side of the four-bar is off by about 1/16″, causing things to be misaligned. Our initial reaction this morning was that the right sidebar needed to be remade, but it turns out that by simply adjusting the position of one of the mounting brackets, we could bring the entire linkage back into alignment. Our morning project is to get the electrical system all wired up, so we pass the robot off to the late night crew in a couple of hours, who’ll lead us in completing the launcher and intake. If you’ve got any questions, or there’s anything you’d like to see more of – be sure to get in touch with us at @TeamCopioli on Twitter!